“There’s hundreds of pages, it’s almost like a big Wikileaks document dump,” says Natural News editor Mike Adams, the Health Ranger, on his YouTube Channel of court documents showing a “clear pattern of criminal collusion” between the Environmental Protection Agency (EPA) and Monsanto. The letter also talked about how certain people who were on Monsanto’s payroll bullied and intimidated other scientists into silence. In a bid to stop these documents from seeing the light of day, Monsanto claimed that these leaks would publicly embarrass them and demanded that they be sealed and kept. The ruling judge, Vince Chhabria, disagreed with them, retorting that the public has the right to know the truth about glyphosates. That’s where the organization U.S. Right To Know comes in. The amazing Gary Ruskin and several others have posted PDFs of the court documents on their website, USRTK.org. Mike Adams, the Health Ranger, has taken on the task of converting these PDFs into text files for easier reading. This is an agency that knowingly and willingly spreads poisons into our food. This is an agency that happily accepts bribes and engage in collusion. This is an agency that is supposed to take care of the American people, and yet care more about fattening the pockets of its members. These are facts and truths that Mike Adams, the Health Ranger, has known about and warned about for years. What is surprising is the amount of mainstream media attention this story is getting. Bloomberg, Reuters and even the pro-vaccine Huffington Post have been covering the story as it develops. Stories about how Monsanto falsified the scientific papers declaring that glyphosates don’t cause cancer have graced these publishers’ front pages. Mike Adams, the Health Ranger, has sworn to call on President Trump to launch a complete financial audit of all the officials and scientists in the EPA and find out who’s been taking bribes from the industry. “It’s time to arrest them and charge them with criminal bribery, and fraud, and collusion, and whatever other charges are appropriate. It’s time for the DOJ to go after this collusion inside the EPA,” Mike Adams, has said. Mike Adams is an award-winning investigative science journalist and bestselling author on Amazon.com. 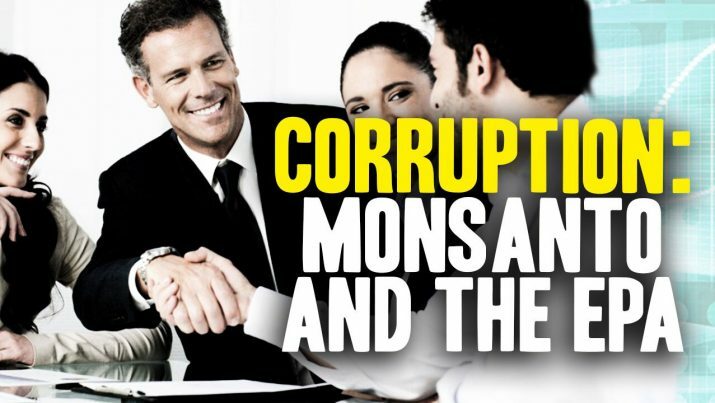 He is known for sounding the alarm on glyphosate tainting the food supply and for exposing the corruption rampant within the pharmaceutical industry. These efforts have made him a target of the world’s most powerful poison-pushing industries. The Health Ranger is also a world-class inventor, having devised a multitude of lab innovations, as well as the lab science direction of an internationally-certified laboratory called CWC Labs. The Health Ranger’s online store carries more than 600 products.